Champlain Elementary has 17 classrooms serving our students as they grow from Kindergarten through fifth grade. Our 2017-18 Classroom Teaching Team is listed below. Click on a teacher’s name to learn more about them. Students at Champlain expand their learning through art, music and physical education classes to be well-rounded students as they prepare for Middle School. The Champlain Elementary School Library serves over 330 students in kindergarten through fifth grade. The Library is open during regular school hours (8:08am – 3:00pm). Parents are welcome to visit during school hours to browse and check out books and other materials from the collection. To access our online library catalog, please click here. Students visit the Library for 45 minutes each week based on their classroom schedule. Reading selections and projects are thoughtfully woven into the Library curriculum to create an engaging, dynamic, and educational platform for learning. Students have the opportunity to jump into a read aloud book selected by the Library Media Specialist and to make connections to lifelong learning through age-appropriate projects or activities. Book choice is a highlight of every student’s time in the Library. Each student has a Library account and is given time to browse the collection and check out two items weekly. Our goal is for every student to borrow one “just right” book to build literacy skills and one age-appropriate book for pleasure. The Library subscribes to several services to enrich and enhance learning in reading, math, science, music, art, and a multitude of other subject areas. To access these online resources when not at school, follow this link to the education supports section of Champlain website. Research shows that reading aloud to your child is one of the most important things you can do to ensure that your child is successful in school. Mrs. Janet Stewart, the Library Assistant, and Susan Ames, the Teacher-Librarian, look forward to supporting each child in their learning and growth. If you would like to volunteer in the Library, please let our staff know. Stop by the Library to say hello and to share your comments or suggestions. Tier I: The school counselor teaches lessons on guidance topics in classes with the classroom teachers present. These developmental lessons focus on cultural competence, such as self-awareness and regulation, growth mindset, coping strategies, decision making, social skills, relationships, and harassment, hazing, and bullying prevention. Tier II: In small groups, the school counselor teaches struggling students strategies for emotional wellness and positive social interaction. The counselor facilitates dialogue pertinent to the participating students’ wellness. Tier III: The counselor provides short-term individual counseling for especially troubled students who need one-on-one attention. Ongoing problems will be referred to parents and/or outside agencies. The school counselor may also provide counseling services to address student misbehavior, such as anti-bias training, anger management, and self-regulation. To contact Champlain’s school counselor, Kaitlyn Morrissey, call 802.864.8477 ext. 31105 or email kmorriss@bsdvt.org. The Educational Support System is designed to help all students improve their school performance and help them grow academically, socially, emotionally and physically. This system provides a way for school staff to address students’ varying needs in school. CES has an Educational Support Team that meets regularly to review the strengths and needs of individual students. If parents have concerns, they may refer their child to the team by contacting the teacher or school counselor. If, despite multiple ESS interventions over time, a student still struggles to learn, a parent may request a special education evaluation by speaking with the school counselor. School Nurse Brian Kelley is available Monday – Friday during school hours. Nurse Kelley supports student success by providing health care through assessment, intervention and follow up for children within the school setting. They work with students, families, staff, medical providers and other community resources to support the physical, mental, emotional and social health needs of all the children in their learning process. If a parent is uncertain whether or not a child is well enough to attend school, then please call Nurse Kelley at 865-5300 for a consultation. The nurse may ask the child to come in for an exam or may excuse the student from school. When is a child well enough to come to school? The child should be fever-free, which is a temperature less than 100.4 F or 30 C for 24 hours, without the use of fever-reducing medication, before returning to school. The child must be free from diarrhea and vomiting for 24 hours before returning to school. Coughs should be easily controlled by a drink of water and not excessive. Cough drops may not be used at school. A physician’s note is needed for an illness related absence of more than three days. ​Accurate, current phone numbers, addresses, medical information and emergency contacts are essential to CES keeping students safe and parents involved. Updates can be made to Infosnap using the code assigned to each family. Please notify the main office of any changes immediately. If a student requires urgent attention, and we are unable to reach someone on the emergency list, the Burlington Police may be called. Parents need to contact the school nurse if their child is in need of a health plan. School nurses or a designee will administer medications during school hours. BSD policy states that prescription medication can be given at school if a Medication at School Form has been completed. Forms are available in the office and must be filled out each year for long-term medications. Medication will not be dispensed without written permission from a licensed health care provider and a parent signature for permission to administer. Prescribed medication must be in the original container with the child’s name. First doses of medicine cannot be dispensed at school. Children may not bring medication to school, medications must be dropped off by an adult. Parents/guardians may request in writing that school personnel administer non-prescription medication. This request will be valid for two consecutive days. The medication must be in the original container. Long-term, non-prescription medications must be accompanied by a physician’s order. Cough drops and lozenges will not be administered at school per BSD policy. Students may carry their own emergency medication; however, written permission from the physician to do so must be on file in the nurse’s office. All students are required to have an updated record of immunization in accordance with the Vermont Department of Health’s recommended schedule, or documentation of exemption status. Failure to comply with the required immunization schedule, or to provide satisfactory documentation of compliance or exemption will result in the exclusion of a student from school until such documentation is provided. Documentation is required before school entry. At Champlain we strive to make the kitchen a classroom through a number of learning opportunities and community partnerships. Chef Kaye Douglas and her team prepare nutritious school meals daily for our Champlain students. Visit our District School Food Project Website to learn more about food at school. Begins at 7:45am in the cafeteria. Breakfast is free for all Burlington students. No sign-up is required; students may come in any day. Adult breakfast is $2.50. Snack is available to all children in the classroom for free, and is served approximately 90 minutes before lunchtime. ​Students have a variety of options to choose from during lunch. Choices include a salad bar, sandwich options, and hot lunch. Menus are posted on the website at the beginning of each month. Prepaying for lunch is the preferred method of payment. Meal accounts help make lunch lines go much faster. Cash is accepted as well. The price of lunch for 2018-19 is: Student lunch $2.25 Milk only $.50 Adult lunch $4.00. There are two ways to add money to a lunch account: 1. Mail or send in a check made payable to BSD food service. 2. Go to mySchoolBucks.com, register for a free account, and pay online. 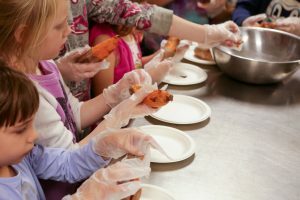 All families are expected to complete the application for free or reduced lunch, because the Burlington School Food Project is pursuing new funding sources. All form information provided by families is confidential. Visit Champlain and see our dedicated custodians working hard to keep our school clean and safe. To reserve a room at Champlain for an after-school or weekend event or to report any concerns, contact District Property Services at 864-2158.